WASHINGTON, D.C. – The Villanova Wildcats traveled to Washington, D.C., on Saturday afternoon where they fell to the Georgetown Hoyas by a score of 68-63. 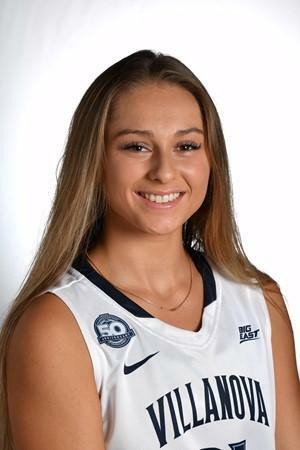 Villanova led 51-49 with 9:09 remaining in the fourth quarter, when junior guard Kelly Jekot scored on a short jumper in the lane and senior guard Adrianna Hahn(Ursuline) drained a deep three to put the Wildcats up 56-49. After Georgetown senior Mikayla Venson made two free throws, Villanova took its largest lead of the game at 59-51 at the 6:50 mark on a three-point field goal by junior forward Bridget Herlihy. Following two free throws by Herlihy that increased the Wildcat advantage to 63-56 with 5:25 on the clock, Georgetown scored seven straight points to take a 64-63 lead with 1:19 remaining. Hoya forward Dorothy Adomako scored the final five points of the run, including a conventional three-point play and a baseline driving lay-up. The Wildcats got a good look at a three to take the lead with 59 seconds to play, but Hahn's triple attempt went off the back rim. Villanova then played solid defense on the game's next possession, but the Hoyas were able to come up with the offensive rebound. With the shot clock off, the Wildcats were forced to foul Hoya guardBrianna Jones who missed both free throws. Following the missed foul shots, Villanova called timeout and advanced the ball to the front court. Villanova got the ball to junior forward Mary Gedaka who drove baseline. Gedaka attempted to pass the ball to Jekot who was open on the wing, but the pass was deflected and went out of bounds of Gedaka with 10 seconds remaining. The Hoyas then went 4-of-4 from the line over the final 10 seconds to seal the win. In the loss, Gedaka led the Wildcats with 16 points and eight rebounds. She was 8-of-9 from the field. Jekottallied 15 points, four assists and two steals, while Hahn made four threes for 12 points. Senior forward Jannah Tucker was the fourth Wildcat in double figures with 11 points. Georgetown was paced by Adomako who tallied a game-high 28 points and a game-best 11 rebounds. White added 25 points, six rebounds and four assists. For the game, Villanova was 25-of-54 from the field (46.3%), 10-of-24 from three-point range (41.7%) and 3-of-6 from the foul line (50.0%), while the Hoyas shot 46.0 percent from the floor (23-of-50), 36.4 percent from behind the arc (4-of-11) and 72.0 percent from the charity stripe (18-of-25). Georgetown owned a 33-26 advantage on the backboards. Villanova was charged with nine turnovers. Villanova returns to action on Friday, Jan. 25, with a road game at Seton Hall. Tip-off is set for 7 p.m.